Duro-Sense thermocouple and extension wires are known for their quality performance and reliability. All wires are carefully selected and matched to meet the Standard Limits of Error of American National Standards Institute Circular MC96.1 Unless specified, all wire will be furnished to standard limits of error. 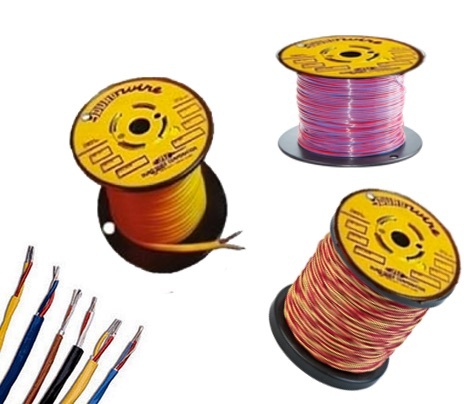 Many of the wires are available with special limits of error and must be specified when ordering. Insulated wire is normally furished on 1000 ft or 2000 ft ± 10% spools depending on insulation and wire gauge. Lengths less than 500 feet may be furnished as a coil. Orders for all insulated and bare wire are accepted with the understanding that Duro-Sense reserves the right to ship plus or minus 10% of the total amount ordered. In addition to the standard and special limits of error wire, Duro-Sense provides a calibration service for customers who require known deviations from specified temperature points, at an additional charge. Each coil or spool of wire so certified is marked and a "Certificate of Calibration" is provided. Certification temperatures available are — 109°F to 2250°F. All equipment used in the certification is traceble to the National Institute of Standards Technology.